Many evergreen shrubs and trees are showing injury from the nasty drop in temperature we had in November of 2014. The temperature on November 10th was in the 60s. On November 12th the temperature dropped to the lowest temperature for that date in history – one degree below zero. That’s a swing of over 60 degrees, one of the largest temperature drops in history. It’s not the low temperature but the sudden change of temperature that does the damage. We expect widespread plant injury to rear its ugly head this spring. 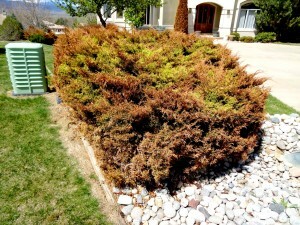 Junipers are one plant genera that were hit hard. Many junipers have significant browning and foliar death. That includes both shrubs and tree types of junipers. 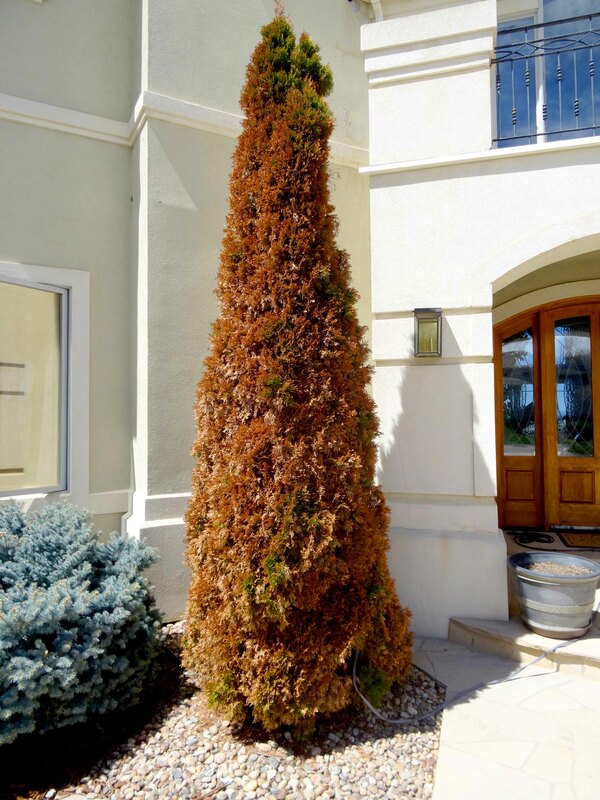 Other plants that are showing injury are Scotch and ponderosa pines, and arborvitae. Many broadleaf evergreens such as euonymus, pyracantha, and daphne have dead leaves. Many deciduous trees and shrubs never completed their fall leaf drop and the leaves persist on the trees. I’ve heard reports of dead burning bushes and roses. Plants must protect themselves against freezing. Even plants that are hardy for this climate zone must harden for the winter or they die. If water freezes inside a cell, the ice crystals puncture the cell membranes and the cell dies. Plants either create anti-freeze in the cell, or transfer water out of their cells to protect them from freezing. However, the process takes time. As the temperature drops in the fall, the cells gradually harden themselves against freeze. If the daytime temperature is high, the hardening process may be delayed. In November 2014, the trees and shrubs didn’t have the time to harden adequately and we’re seeing the unfortunate result. One common misconception is that too much water or fertilizer in the late summer can cause succulent growth that won’t harden properly in the fall. In truth, winter hardening is a metabolic process that requires energy, and depriving the plant of water or adequate fertilizer will slow down the trees metabolism and hinder the winter hardening process. Healthy vigorous plants can tolerate stress much better than weaker plants. The question is what can we do to help the plants now? I think the best answer is to be patient. Wait and see how the plants recover. Often the freeze kills existing foliage but leaves the buds alive to put on new foliage in the spring. The plants may recover. Don’t try to prune the dead out now. I’ve already seen plants ruined from people trying to prune out the freeze injury. Don’t fertilize now. Fertilizer is not plant food, it provides no energy, only essential elements. In fact fertilizer is a short term energy drain on the plants because energy is required for plants to take up the fertilizer. The plants can’t spare that energy now. It will take all their stored reserves to replace lost tissues. Many plants did no complete their fall leaf drop, a process called abscission. One job of the abscission process is to block the vascular system to prevent water loss from the plant. The winter freeze may have left the vascular system open to water loss in many plants. Therefore, winter watering may be more important than normal. Fortunately, this winter has been fairly moist in Boulder and winter watering, for the most part, hasn’t been needed. If you have questions about your plants or need recommendations on their care, give us a call to set up a consultation. 303-530-0640. This entry was posted in Uncategorized on April 18, 2015 by Stef.